Our research on the unique flora and fauna of São Tomé and Príncipe Islands is allowing us to document the different kinds of critters that are endemic; i.e., found there and only there. And there are many of all kinds. It is important for us to do this so that the citizens of the islands are aware of how different these islands are from the rest of the world so they can make informed decisions in the future. I have already stressed how poorly known the biota of these islands is, and a good example lies in our mushroom work which you can read about in “May Day Mushroom Madness“, below. Prior to our work, only four species had been listed from São Tomé and no one had ever looked at Príncipe. Now, as a result of our most recent expedition (GG III (A), we have 225 species, 75 of which are listed for the first time from Príncipe—and our mycologists Dennis Desjardin and Brian Perry tell me many of these are new to science. As I established in the first blog below, “Islands at the Center of the World,” São Tomé and Príncipe, and also tiny Annobón are classic oceanic islands; they have never been attached to mainland Africa. 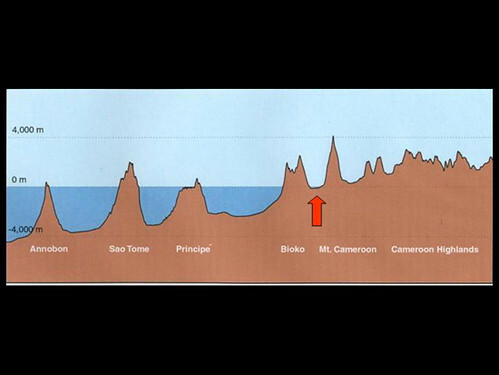 This is obvious from the island cross-section above – you can see that the first island, Bioko, is separated from the mainland by very shallow water (arrow), and it was clearly connected to the mainland perhaps numerous times during the Holocene as sea levels rose and fell. However our oceanic islands are surrounded by water depths of up to 4,000 meters and could never have been connected to the mainland. 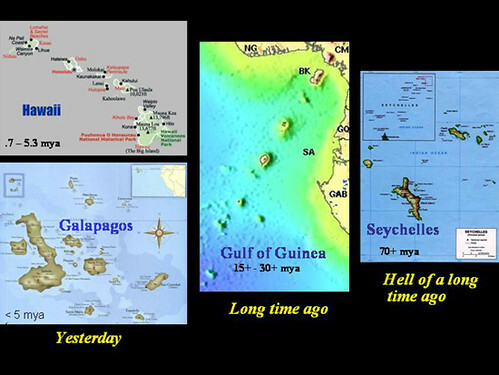 This means that everything living on the islands had to get there from the mainland (or somewhere else?) across several hundred kilometers of deep salt water. As described in the first blog, this happens by random chance and we call it dispersal. In the case of the Gulf of Guinea, there has been a lot of time for this to happen: São Tomé and Príncipe are very old as islands go (the Seychelles are a special case). Once established, colonist species begin to accumulate genetic changes and ultimately become endemic, that is physically and genetically isolated from their ancestors on the distant source continent. We are able to predict the sorts of plants and animals we are most likely to find present and established on oceanic islands. Distance from the source is a limiting factor and, of course, so is island area— the larger and more diverse the island the greater the array of suitable niches for colonizers. But for an individual species the most important parameter has to do with behavior, morphology and physiology in determining “who gets there successfully.” It is a fact that some species are better able survive crossing broad saltwater barriers than others; these, we call good dispersers. 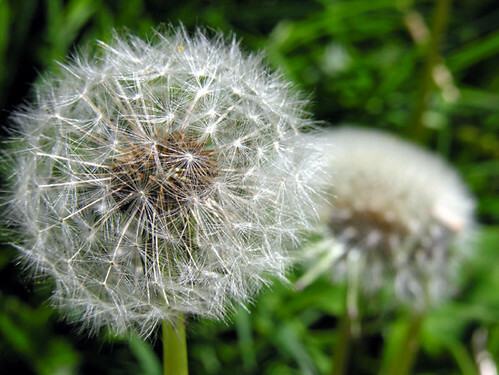 Good dispersers include many plant species with either resistant seeds (e.g. palms) or seeds that are wind-dispersed. 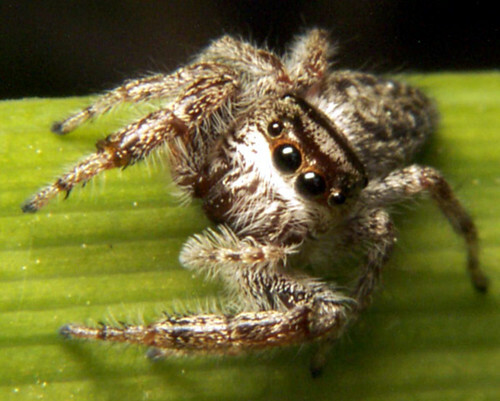 Spiders, notably species that disperse by “ballooning,” are also good dispersers; as tiny juveniles, they spin a single long strand of silk that is caught by air currents, enabling them to be carried great distances. 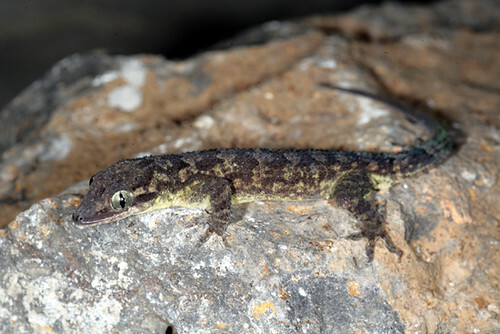 Some lizards such as geckos and skinks commonly make good dispersers and successful colonizers of oceanic islands. 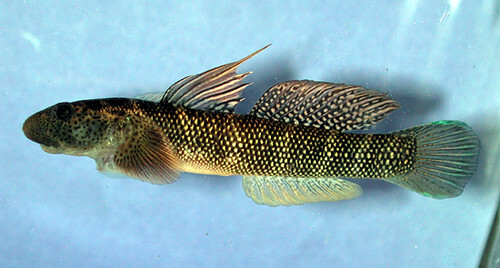 Conversely, there are poor dispersers, species we would never expect to cross expanses of salt water; a classic example is primary freshwater fish (species that evolved in freshwater, as opposed to some groups that are anadromous, spending part of their life cycle in both) There are groups that evolved in saltwater but have members that readily adapt to freshwater; these are called secondary freshwater fish. 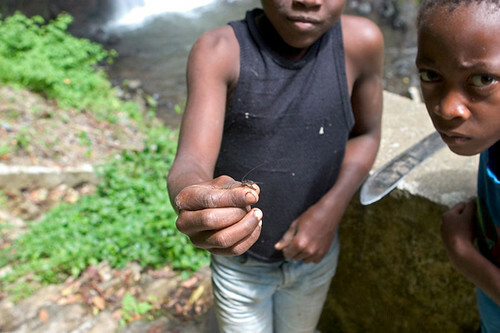 All of the fish we have found in the many streams on Sao Tome and Principe are secondary freshwater fish, most gobis. São Tomé and Príncipe are remarkable for the large number of endemic species that live there, but it is the nature of some of these species that is even more fascinating to me. Some of these endemics fall into the category of “poor dispersers”; I mean really lousy dispersers. Amphibians, because of the structure of their skin, freshwater aquatic larvae and unshelled eggs, are second only to primary freshwater fish in their lack of tolerance to saltwater. They are never predicted as successful colonizers of oceanic islands. Think of it: there are no native amphibians whatsoever on either the Hawaiian or the Galapagos Islands. Prior to our work in the Gulf of Guinea, the only other frog group shown to have crossed saltwater barriers are populations of rocket frogs (Ptychadena) on Madagascar; this was not dicovered until genetic work was completed in 2004. 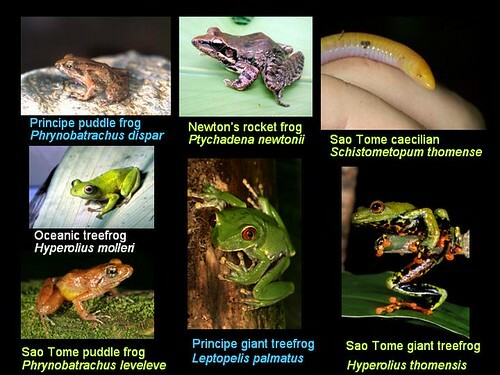 But São Tomé and Príncipe are not limited to just one amphibian endemic colonizer; there are fully seven species there belonging to five families, each of which must have somehow crossed the broad expanse of saltwater separating these islands from Africa. 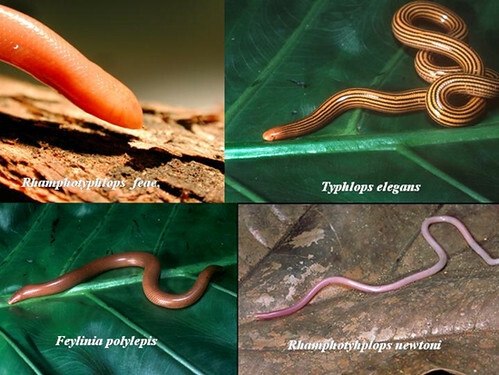 The fact that there are any amphibians at all on these islands is surprising enough, but that such a diverse fauna exists there which also includes a legless burrowing caecilian, the cobra bobo (found only on São Tomé), is truly mind-boggling. How does such a creature get across the ocean? 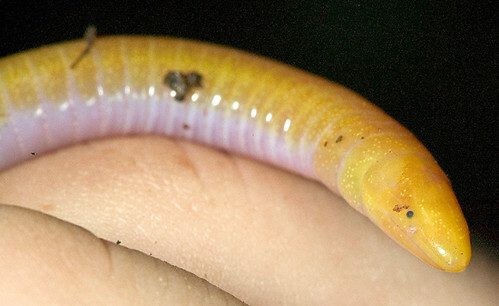 “Cobra bobo,” Schistometopum thomense. Sao Tome. (Weckerphoto – GG III). Before we try to answer this question, there are some other endemic species on the islands whose presence we would not predict. 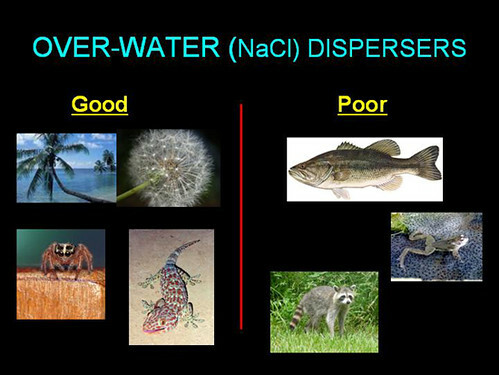 Except for bats (especially of the Family Vespertilionidae), mammals are considered very poor dispersers, largely for physiological reasons. We mammals have to continually eat (stoke the fire, so to speak) in order to maintain our constant body temperatures; for this reason, mammals cannot tolerate long periods of exposure and are unlikely to survive long ocean passages before succumbing to hypothermia (unless, of course, there is food available). 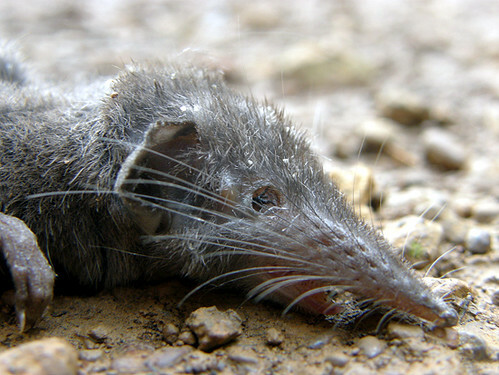 And among mammals, the critters that have the largest heat loss problems are the shrews; these tiny creatures have such a large surface area relative to their mass that they lose heat constantly and rapidly, to the point that an individual shrew has to eat continuously just to avoid dying by hypothermia. 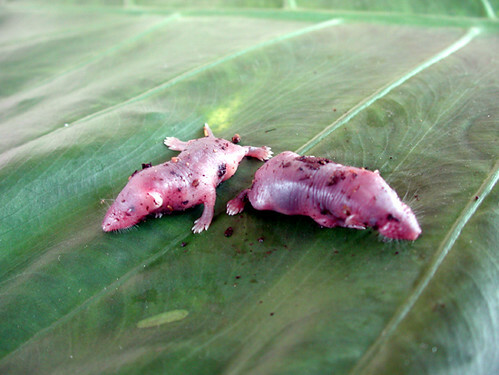 These would be the very last sorts of mammals we would predict to successfully colonize an oceanic island; yet there is an endemic shrew on São Tomé, Crocidura thomensis (we have not yet seen it, although I am informed there are scientists currently looking for it), and an species assumed to be from the mainland, the White-toothed shrew (C. poensis) inhabits Príncipe. We have to consider the possibility that this latter species was brought in by man, but if not and if C. thomensis is a naturally occurring endemic, how on earth do such fragile creatures survive an ocean crossing? 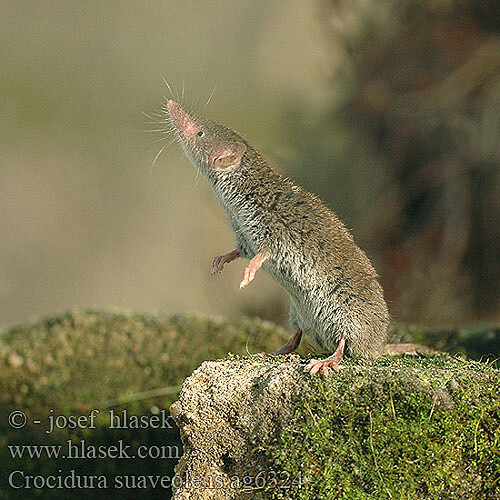 Crocidura suaveolens, an Old World Shrew. There are a number of ways species can be naturally dispersed across saltwater barriers: some can fly (bats, birds, many insects), they can be carried by winds and storms (seeds, insects, birds); some salt-tolerant species can float or swim (palm seeds, tortoises to Galapagos and Aldabra, the ancestors of the marine and land iguanas of the Galapagos). Darwin postulated that amphibian eggs might be dispersed on the feet of wading birds, but to my knowledge this has never been demonstrated. A mechanism of dispersal that is frequently invoked by biogeographers is rafting. I remember as a student that it was not difficult to imagine a gecko or its eggs, being carried out to sea on a floating palm tree or chunk of riverbank and then ultimately washing up on an island shore. This no doubt has occurred many times throughout history, but it of course requires that the hitchhiker have certain tolerances to exposure, potential starvation, etc. My colleagues and I suggest that rafting is the most likely scenario for the colonization of the Gulf of Guinea Islands by the amphibians and reptiles, but on a much grander scale than a few pieces of floating matter over time. 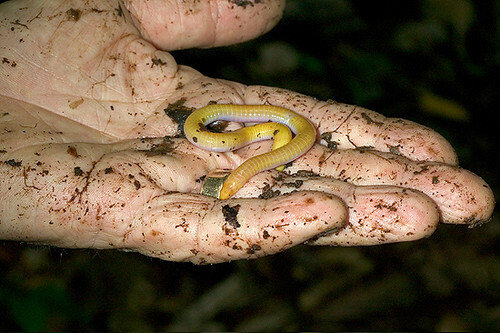 I say “much grander” because along with the caecilian, Schistometopum thomense, nearly half of the endemic reptiles on the islands are also fossorial, legless, burrowing species. Their continental relatives are all fossorial as well, so we know that loss of limbs has not occurred since these species arrived. It is extremely difficult to imagine a mechanism by which burrowing species can cross a saltwater barrier unless they are floating on and carried by really large rafts. I will explain our hypothesis in more detail in Strange Bedfellows, Part II. We gratefully acknowledge the support of the G. Lindsay Field Research Fund, Academy Research Venture Fund of the California Academy of Sciences, the Société de Conservation et Développement (SCD) for logistics, ground transportation and lodging, STePUP of Sao Tome http://www.stepup.st/ the staff of the Ministry of Environment, Republic os Sao Tome and Principe and especially the generosity of three private individuals, George F. Breed, Gerry F. Ohrstrom and Timothy M. Muller, for making these expeditions possible.